Saturday night in Los Angeles, Blake Griffin leapt over the front hood of a Kia Optima, caught a pass thrown through the car's moonroof by a teammate sitting inside, and completed the alley-oop to win the 2011 NBA Slam Dunk Contest. As a long-time fan of hoops in general and the slam dunk contest in particular, I give Blake's jam a 44 out of 50. The presentation, involving the car, a choir singing "I Believe I Can Fly" as Griffin readied for the jam, and the flea market barker mic' skills of Griffin's "coach," ex-player Kenny Smith, scored a pure 50: Genius by way of pageantry. The dunk itself lacked the beautiful violence and video game level athleticism of Griffin's other jams; his earlier "stick my arm down the hoop and hang from the rim by my elbow" flush was far more impressive. No matter, though: What about the car? I'd never seen, or at least never paid any mind to, the Kia Optima before they rolled one out onto the Staples Center floor for Master Blake to fly over. As one of the TV analysts put it, "That's a good lookin' car!" And it is, I think. Or at least I did when watching it on TV – yesterday I saw one on the streets of Oakland and was a bit less impressed. I'm pretty sure that part of it was the Optima in the dunk contest was the flagship SX model with its trick 18″ "luxury alloy wheels" while the one I saw in person was a lower-trim model with less-fly rims. And, of course, cars look cooler when world-class athletes are jumping over them on national TV while a live choir sings along. I mean, duh, everyone knows that. Still, the Optima is a pretty cool car. It looks all European sophisticated, kinda like the new Hyundai Sonata to which it's related (Hyundai owns Kia, as a matter of fact). Reviews of the current Optima are pretty impressive, too. Class-leading fuel economy, solid handling and ride quality, and a bevy of standard options and technology have led automotive journalists to talk about Optima being a worthy challenger to the Audi/BMW/Mercedes mid-sized sedan triumvirate, despite the Kia's lack of European lineage and a price tag roughly half that of its German competitors. Though the Optima lacks rear wheel drive, the top of the line turbo SX model puts out some 274 hp and 269 lb-ft of torque, torque that kicks in at a nice, low 1750 rpm for diesel-style low-end thrust – all while offering up 22 city / 34 highway mpg. Look for an Optima hybrid to up the Green quotient in Kia's US lineup later this year. 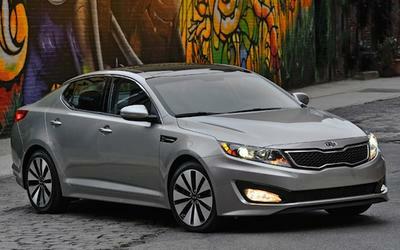 The entry-level Optima LX starts at just $18.995. A turbo-charged Optima SX has a base sticker of $25,995, and checking every options ticker I could find on Kia's online car builder got me up to $31,170 including destination charge. That's about 35% less than the cheapest Audi A6, which starts at $45,200 without any options or destination fees. But does it matter? Is the Optima LX a contender or mere pretender? Is it a mid-sized sedan to fly around freeways, or just a stage prop to be dunked over? With its good looks, fly wheels, and turbo four engine saving thousands of dollars up front and more on gas down the road, is Kia's 2011 Optima a truly deadly challenger to the sport sedan establishment, or when all's said and done is it ugly but deadly, or not even deadly at all?